I rather enjoyed Jason Bateman's 2014 directorial debut Bad Words. I think I've watched it more times than I initially imagined I would given I thought it was fine, but little more. That said, I was really excited to see what Bateman would do next in the director's chair and boy does he deliver. While I had tempered expectations for The Family Fang it was clear after the films cold open that we were in for something pretty unique. This is in fact the strongest element the film has going for it in that you never quite know where it's going. Eventually, given the circumstances presented, we understand the themes of family and liberation that are being touched upon, but never do we know exactly what will happen next. This is due largely in part to the fact the premise is so different and off the wall. 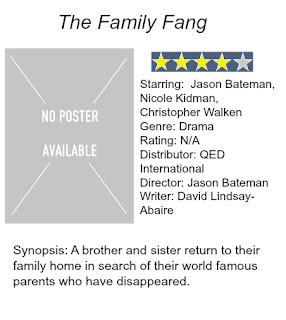 Adapted from a 2011 Kevin Wilson novel by screenwriter David Lindsay-Abaire (Rabbit Hole, Oz the Great and Powerful) The Family Fang is a film that is telling a dysfunctional family story through the conduit of performance art. With this material Bateman has taken advantage of the dark comedic tones the story highlights and is really able to explore not only his growth as a filmmaker (you can feel the more assured hand at work), but a more complex range of emotions. Bad Words was very on the nose for the sarcastic, cynical straight man, but Family Fang requires more layers and layers he has provided as his latest film never stops evolving and the characters only grow out of the demons they're forced to come face to face with. When talking about the "cold open" what we're presented with is a scenario in which a young Caleb Fang (Jason Butler Harner) and his wife Camille (Kathryn Hahn) throw their kids Annie (Mackenzie Brooke Smith) and Buster (Jack McCarthy) along with themselves into a piece of performance art consisting of a bank, a fake gun, fake blood and a camera in a police officers cap. The Fang's, Caleb and Camille, become well known for their performance art and their seeming commentary on social issues. Some see it as a series of pranks while others find it profound. Some see them as jokes while others consider them true artists. Caleb certainly considers himself to be an artist. That's all he's ever wanted to be, pure and simple. The satisfaction for him is not in the finished product or the reaction of those watching the finished product, but rather the reaction of the people involved in the performance. That, he says is where the true art lies. In retrospect, both Annie (Nicole Kidman) and Buster (Bateman), look at their parents with a large amount of resentment; feeling they took away their childhoods from them in some measure and used for pawns in their schemes to break the monotony and shake people up. Given Buster has grown up to be a novelist and Annie a famous actress neither have been home for some time, but when Buster is the victim of a potato gun accident that leads to an unexpected reunion Caleb and Camille immediately switch back to their old ways. Tensions are high though, leading us to understand why such reunions don't happen often, but when their now much older parents (Christopher Walken and Maryann Plunkett) disappear Annie and Buster can't decide if something's really happened to them or if they're up to their old tricks again. Given that this is still a story of family dynamics it is the characters that will make or break how appealing the final product turns out to be. This is no problem as the Fang's clearly have their passions and their certain informed opinions about everything that is of a priority in their lives including art whether it be in acting, writing or creating performances from scratch. What is most interesting from our two lead characters, Annie and Buster, are the differences with which Kidman and Bateman approach their characters in approaching their situation. Kidman's Annie doesn't believe for a second that their parents disappearance is legitimate and sets out immediately to look for clues as to how to find them out. Bateman's Buster, on the other hand, isn't so sure. What if they were killed? What if they really are dead? "If they were it would be horrible, but if it they're not it would kind of be worse," Buster tells his sister at one point. And it's true, it's what we as an audience think the moment this plot point is introduced and while each individual will naturally draw their own conclusion as to what happened what is more important than the truth of the matter is what Annie and Buster do with the facts provided to them. With this in mind, Bateman pushes his film to analyze the inability of children to move out from under their parents thumbs. To work out for themselves that we can only do what matters most for the people who matter the most to us and that it will forever be impossible to fix people the way we want them to be, but instead that if we focus on fixing ourselves that would be enough. This all may sound like some pretty heavy stuff for a Jason Bateman film and it really is. I never expected, especially in his second feature and even considering the fact Bad Words was a dark comedy as well, that his next project would dabble in such intimate and sometimes heartbreaking moments. There are a number of small, quiet scenes between different family members that transcend all of the surrounding factors of performance art and sacrifice for the sake of art. Kidman is especially affecting in a scene where she's watching an interview of her father she's never seen before and he more or less says that his love for her has always been on the condition she helped him with his art. And while both Kidman and Bateman have their share of moments it is Walken who's really granted the opportunity to chew the scenery and man, does he run with that opportunity. Caleb's domineering mentality and creative prowess over everyone in his family overtakes every other desire he possesses. This drives him to a make a speech at one point in the film about how all parents damage their children. It is a touching and revealing moment that perfectly sums up the tone of the film and is perfectly conveyed through the sentiment that Walken presents it in. What will be overlooked, but is one of my favorite aspects of the film is the look and style that Bateman and his cinematographer Ken Seng (who also worked on Bad Words and Disconnect) employ to elicit a certain kind of nostalgia. Beginning in the seventies every frame is soaked in these green and yellow hues as if to give off a time worn nature to the film. Bateman's Buster wears his fathers old clothes throughout the majority of the film only reinforcing this aesthetic further. The score from Carter Burwell also enhances this specific time period while using lots of chimes and other quirky sounds to compliment the mood and the environment of this confined and familiar setting in upstate New York. There is no movie without these characters though and it is in this area that the film accomplishes the most. Like any film, we know nothing of these people before meeting them in the first scene, but somehow this became more evident to me while watching The Family Fang due to the fact that despite I felt I came to know these two siblings so well, I never knew what to expect from them as far as where the movie would go. Both Annie and Buster do a considerable amount of maturing and by the final frame we feel their sense of accomplishment and are more than pleased to have shared in this journey with them.